For nearly three months Bella Frutta on Willow and Shepherd has hosted food trucks, creating a local food port similar to other west coast cities. While Portland, Seattle and San Francisco all have local meals on wheels (food trucks), traditionally Clovis/Fresno has been served mostly by taco truck vendors. However, in the last three years, street food mania is roaming across the Central Valley, boasting mobile dinners that have diners returning to curbside cash and carry. After the success of Taco Truck Throwdown 2 at Chukchansi Park at the end of August 2012, four trucks continue to make a name for themselves beyond downtown Fresno. While tacos make up the daily menu, each are creating a niche that has patrons standing in line. The Bella Frutta property hosts four food trucks each Saturday from 9:30 a.m. to 4 p.m. and often on Sundays on the corner of Willow and Shepherd. 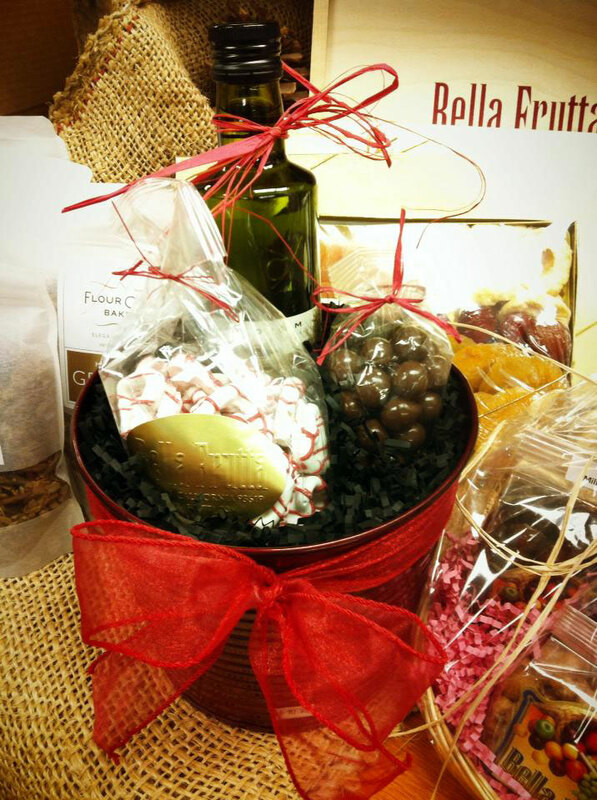 While Bella Frutta is known for its fresh fruits, vegetables, nuts and olive oil, gift baskets are available year round. Vincent Ricchiuti, Director of Operations at P-R Farms, Inc. , says Bella Frutta’s family fresh produce store is teaming up with four Valley food trucks to create the best weekend urban dining option in the two cities. And as it happened, it seems creative minds were working independently of Ricchiuti three years ago. All four food trucks who line the parking lot of Bella Frutta began independently creating delicious meals ala San Francisco’s Ferry Building. Dustin and Kristen Stewart, graduates of San Francisco’s Le Cordon Bleu, wanted to open a food truck in the Big City that specialized in local and organic ingredients. But combined with the need to purchase a truck and the $10,000 start-up fees, opening a food service on wheels proved impossible. So they decided to move to the Central Valley where most of San Francisco’s food trucks’ “local ingredients” came from. Dusty Bun creations are all made from scratch, including the original Eggman w Niman Ranch Ham (top left), -Linguica Chili Fries w/ Rumiano PepperJack and (right) and the original Original Dusty Bun-Mary’s Organic Chicken slow roasted in our Chipolte sauce with a California sesame cabbage slaw. Dusty Buns is a kitchen on wheels. And, according to husband Dustin, the married couple of three years makes everything they sell from scratch. Their EggMan sandwich has a freshly baked bun, a slice of Niman Ranch ham, aged white Cabot cheddar cheese and a local fried egg from Page River Bottom Farm. Downright delicious and unique. Kristen and Dustin Stewart made the commitment to Dusty Buns in Fresno after moving from San Francisco nearly three years ago. 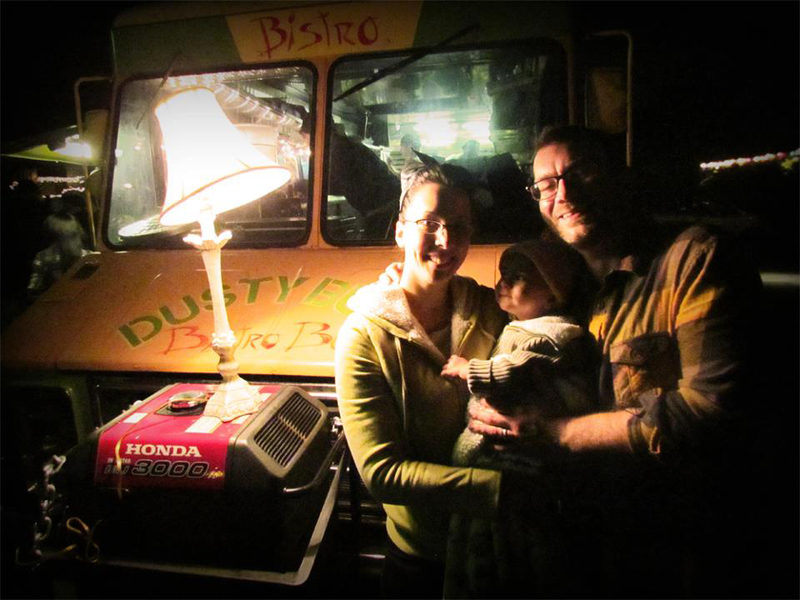 They own the Dusty Buns food truck and Dusty Buns Bistro near Fresno High. Kristen said the truck and bistro only use vegetables and ingredients that are in season or can get them locally through Balakian Farms. Their Dusty Bun sandwich uses Mary’s Organic Chicken slow-roasted in their homemade Chipolte sauce. Currently their dicon sesame cabbage slaw uses purple cabbage, purple onion and a specially prepared herbed aioli mayonnaise. Most sandwiches are $5. Side orders of bistro fries, soup du jour and market salads add $4 each. In the days to come, they will also offer a boxed lunch for offices. Any sandwich + any side + any sweet OR fruit juice for $10 (miniumum order in $20). The Dusty Buns Bistro is just north of The Tower District at 608 E Weldon Ave., Fresno, CA 93704. You might catch their Bistro bus driving to Cru Wine Company in Madera selling lunch boxes or look for them in Fresno’s Tower District during the Mardi Gras Parade! Their menus and photos are posted daily on the Dusty Buns Facebook page and change with the seasons. Call (559) 486.2867 now to book a weekly office delivery or special event! James Caples owns what he calls a “brunch truck” since November 2012. The former corporate restaurant manager chose to alter his career path last year after his daughter died. 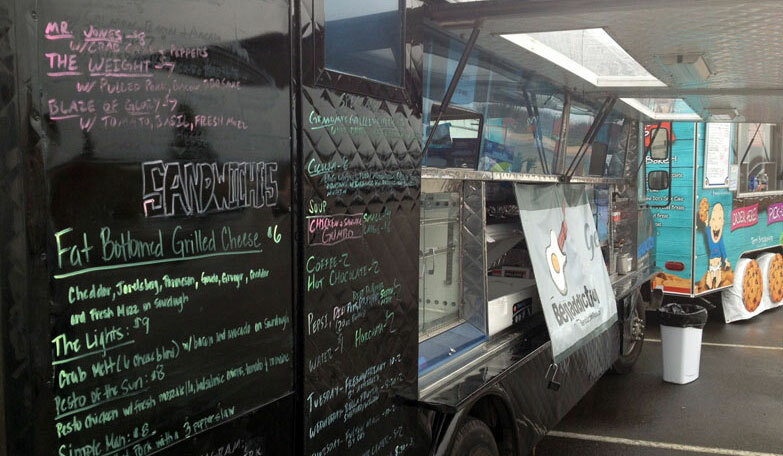 Caples said his Benaddiction food truck focuses on eggs and breakfast-style sandwiches. Everything on the truck is named after a song in some form or another. Some after classic rock, some from more modern songs. That is why their logo is the egg and bacon guitar. Each of Benaddiction’s egg sandwich creations are named after rock songs or artists. James Caples started the food truck in November 2012 after the death of his daughter. Caples gave much of the credit for his truck being at Bella Frutta to Vincent calling him out to be a part of the truck event. The Weight is Caples’ favorite Benaddiction sandwich. 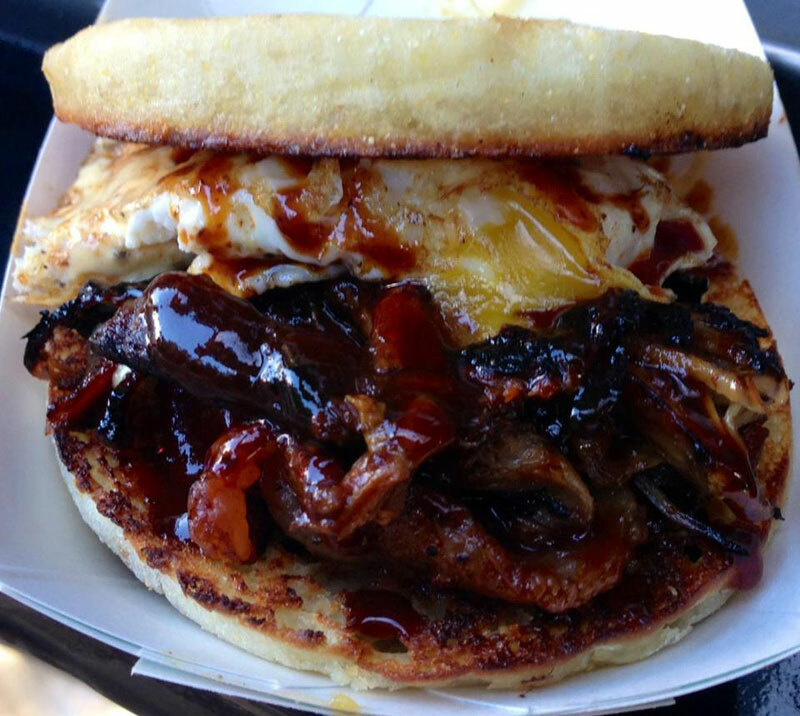 It has pulled pork, bacon and BBQ sauce along with a fried egg and hollandaise sauce on a English muffin. Benaddiction sandwiches or entrées cost $5 to $9 and they will occasionally create a special sandwich that costs up to $10. Caples and his wife Natalie own the truck and have hired a classically trained French chef, Jason Valencia, to create unique sandwiches. The full Benaddiction breakfast and lunch menus are online on their web site. Additional photos and menu ideas are on the Benaddiction Truck Facebook page. For more information or to reserve a special event, call (559) 269.1968. Not to be outdone by the two trucks on either side of them, Tako BBQ Fusion creates Korean fusion meals which barbecues meats and fuse them with other international food items. Originally from New Jersey, owner Tony Mullings and his Korean culinary-trained wife, Eun Joo Mullings, saw what was happening in L.A. with Kogi BBQ and believed they could replicate that success. So in April 2012, they started Tako BBQ. After reading the food truck business was doing well in L.A., owner Tony Mullings and his Korean culinary-trained wife, Eun Joo Mullings, started Tako BBQ in April 2012. Their Kalbi (short rib) taco ($2) is ricco size with two small corn tortillas, seasoned ribeye meat topped with a sesame seed oil sauce and Korean spices, has become a staple for many of their customers. The spices give the taco depth and the meat is seasoned all the way through. This is a wonderful way to introduce a new twist on a local favorite. The Bulgogi and spicy pork tacos are also a great option. The Gogi burger is marinaded ground beef with jack cheese and a Korean spices seasoned salad in between the buns. Tony said the favorite items off the truck are the chicken burritos ($6), the Gogi burger ($6) and the Korean cheesesteak: a Korean Philly ($7). Each has Korean spices, salad with a tangy vinaigrette dressing. 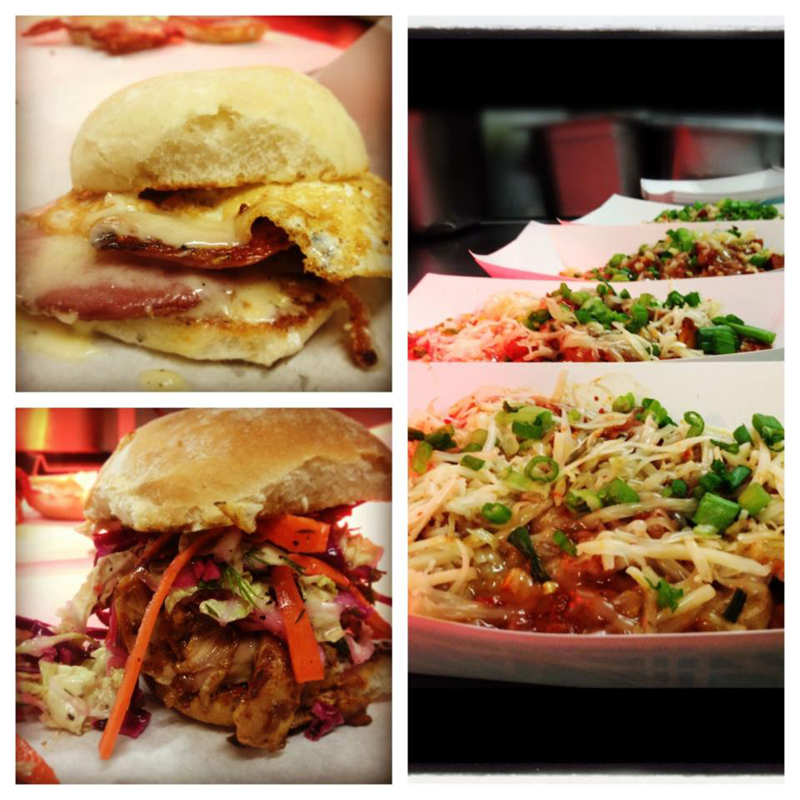 Tako BBQ Fusion creates Korean fusion meals which barbecues meats and fuses them with other international food items. 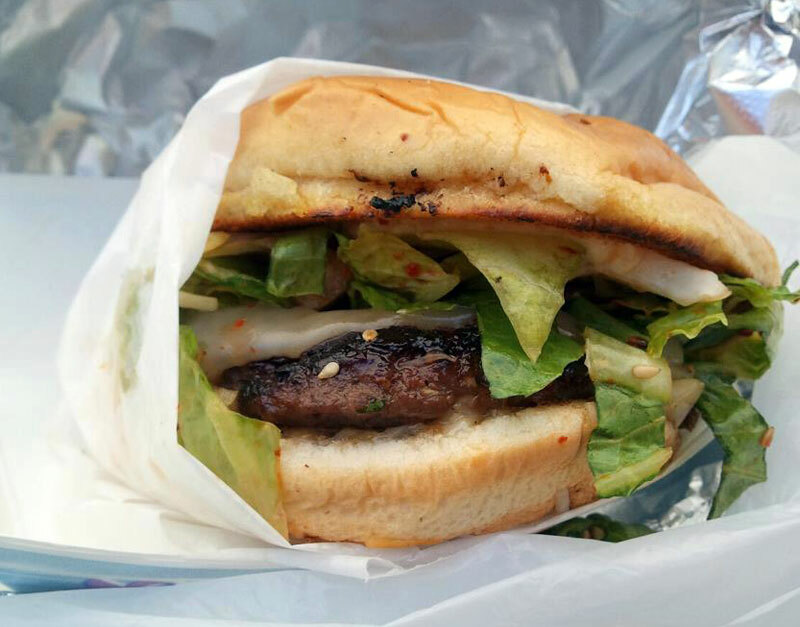 The Gogi burger has marinated meat with Jack cheese infused with Korean seasoned salad in between the bun. The Tako BBQ web site is still under construction at the time of publication, but return to it in the weeks to come for more information and menu options. 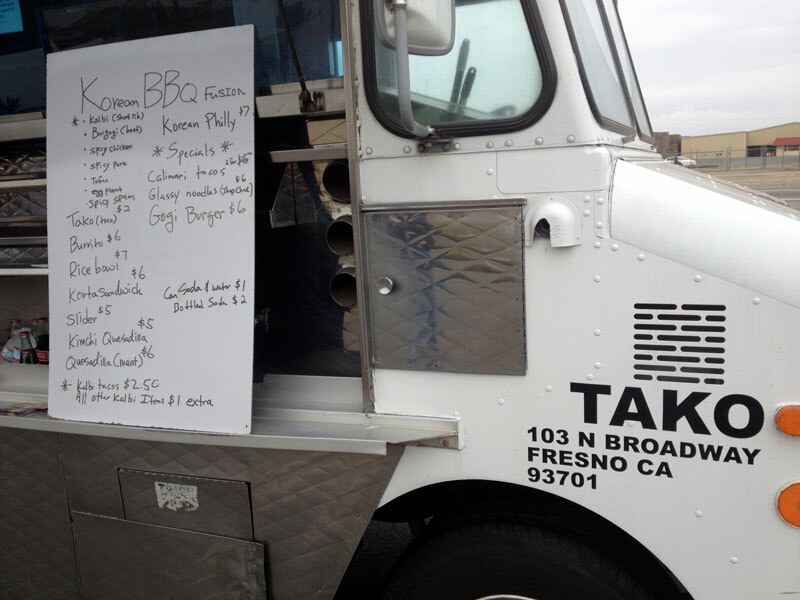 There are lots of photos of their food and menu on the Tako BBQ Truck Facebook page . However, please call (559) 473.3961 to book a party or reserve the truck for a special occasion. While folks are eating their lunch or early dinner at the other three food trucks, the line builds for dessert or picnic favorites at the Crumb Snatcher Goodies food trailer. 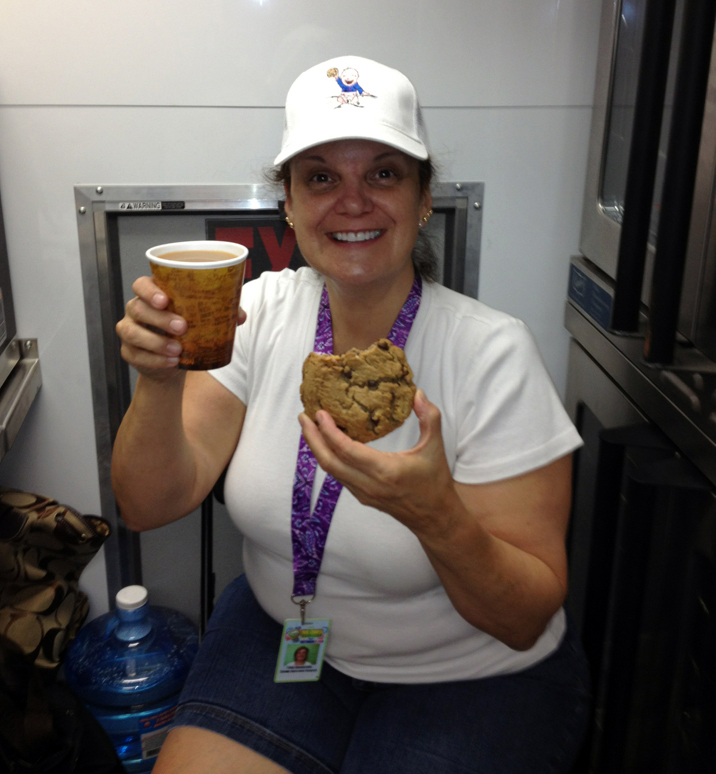 Owners Bob and Terri Brookshire create award-winning chocolate chip cookies, carrot cake and her Grandma Dot’s spice cake all in the mobile trailer. After losing her husband in a tragic accident, Terri married Bob Brookshire in 2009. Today the two own and operate Crumb Snatcher Goodies. Like the other food trucks parked with them, the Brookshires are still new to the mobile food gig–two years. Both Bob and Terri called each other their best friends and it was easy to see. However, their story of sweet breads, cookies and goodies is only a small part of their four-year married tale. Fresno Bee writer Bethany Clough wrote in a June 7, 2012, article, “Eating out: Baking helps widow heal, thrive,” Terri is alive because of divine providence and an angel of a man who did not know her 4 1/2 years ago. After a horrific car accident killed her first husband, Brad Issac, in May 2007, Terri was left with ankles that were mangled and wheelchair bound for months. And as Clough describes in the article, Terri believes God gifted her a second life with a man of faith and a second career: baking. A registered nurse by day, Terri Brookshire has been baking since her childhood. 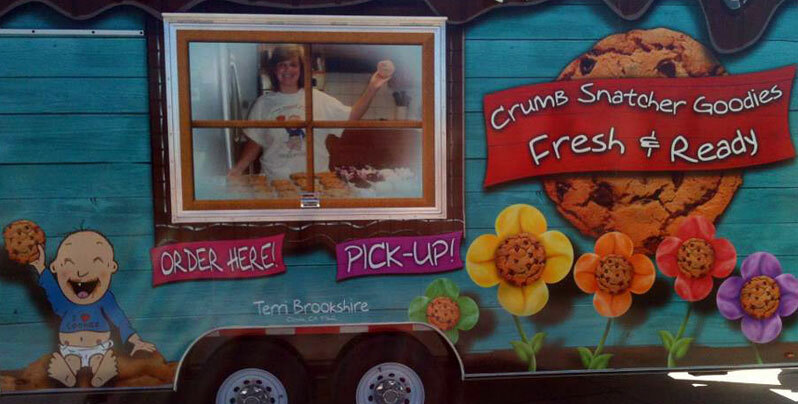 Today she creates award-winning cookies, cakes and breads through her Crumb Snatcher trailer. While Terri was recovering from her injuries, she baked to while away the hours. Months later, Terri needed a ride home from the hospital and her best friend asked her dad to pick up Terri and bring her home. In the days, weeks and months that followed, they fell in love and started Crumb Snatchers. Their chocolate cookies, carrot cake banana and pumpkin breads have all done first place honors at the Big Fresno Fair. However, don’t be fooled by a trailer that has been only operated for two years. Terri has been baking since childhood, baking apple pies to earn extra money during the lean times of the last decade. Her months in rehab. gave her time to hone her skills. For the last 15 years, Terri Brookshire has won first place ribbons at the Big Fresno Fair for her baked goodies. Today, Terri still works 32 hours a week as a labor and delivery nurse at Kaiser Permanente. However, Terri and Bob make time to be involved with CartHop Fresno food trucks that meet up two or three times a week. Terri said they meet with other trucks near Applebees at Friant and Fresno streets on Tuesdays and Fridays on the Fulton Mall. Terri and Bob Brookshire can be contacted through their personal Facebook page beside the Crumb Snatcher Goodies Facebook page. 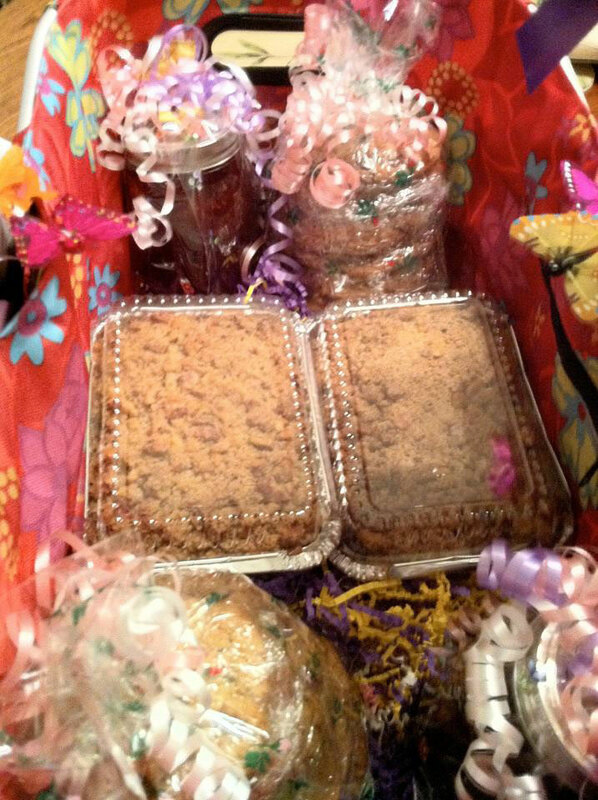 For more information on The Crumb Snatcher Goodies trailer, contact Terri or Bob at (559) 297.0178 or (559) 360.7630. Bella Frutta continues to sell its own freshly harvested vegetables, nuts, and fruit that are locally grown on the family farm since 1946. Today Patrick V. Ricchiuti and his son Vincent represent the third and fourth generation of agriculturalists who continue that tradition in Clovis. 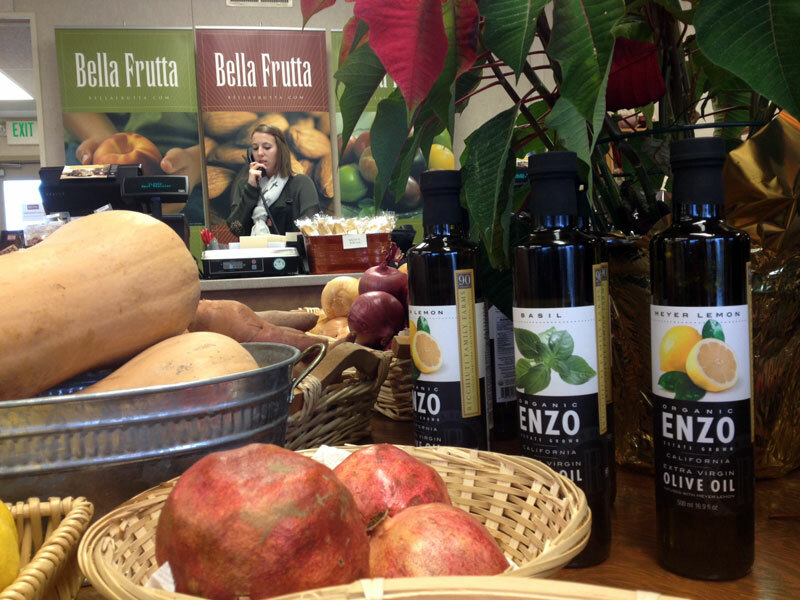 While Bella Frutta has sold fresh farm produce since the mid ’40s, they now grow and bottle their own olive oil under the Enzo label. The Ricchiuti family also partners with Fresno State’s Rue and Gwen Gibson Farm Market , selling their ice-cream, milk and sweet corn when in season. The newest addition to the store is their Enzo Olive Oil Co.. The olives are all estate grown and Vincent is the miller. He presses the olive oil and is certified. You can also visit them on their Enzo Organic Facebook page or watch ABC30’s AgWatch Video, “New, locally produced olive oil earns award” (August 15, 2012). However, it is the partnership with the four food trucks that has Vincent excited. “I love having the food trucks here each weekend,” Vincent said. “When I travel out of state and see the other truck food ports are doing, I know we have something similar here. I reached out to our local food trucks via Twitter. I believe we now have the best collection of food trucks in the Central Valley. For more information on Bella Frutta Bella Frutta , contact Vincent Ricchiuti at (559) 298.8290 or drive out to Bella Frutta : 1959 N. Willow Ave., Clovis, CA 93619. The email address is info@bellafrutta.com. READERS: Have you tried the meals on wheels trucks or been to Bella Frutta? Leave a comment at the bottom of the article. For more TalesoftheCork stories, scroll to the top of the menu bar or read The Grape Tray reopens in Fresno’s Opus I Center . The Fresno Regional Independent Business Alliance (FRIBA) was formed in late 2010 to educate, market and inform the public on the importance of supporting locally owned and independent businesses. One result of this group is Fresno Restaurant Week, now in its second year. Actually it’s Fresno Restaurant Weeks, but whose counting. 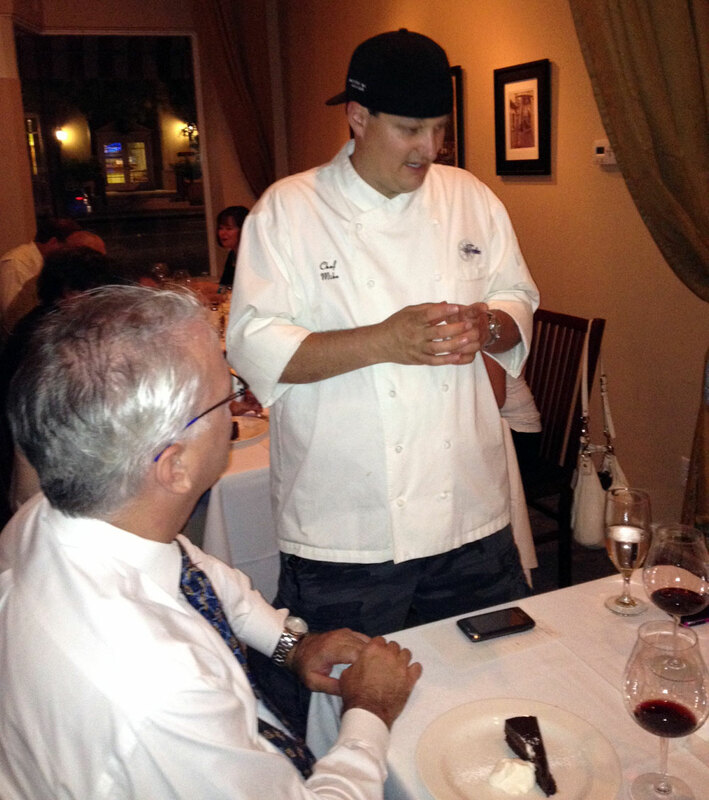 Chef, Mike Shackelford, often visits with Trelio patrons each evening after serving the main dishes. Located in downtown Clovis, Trelio is one of 25 Fresno area restaurants participating in the two-week promotion. In an effort to educate the area community about independent local restaurants, FRIBA along with six sponsors, have listed 25 eateries for the 2012 Fresno Restaurant Week, July 20-Aug. 3. Amy Huerta, who works for the City of Fresno as the Local Business Initiative Manager, says that FRIBA serves all kinds of local businesses; Fresno Restaurant Week is just one way to grow area commerce and provide traction to develop the organization. All 25 restaurants have paid a $500 fee in a cooperative marketing action plan. Huerta believes FRIBA not only has tremendous growth potential for the sponsors and businesses who participate, but also sees the organization developing and expanding to include other smaller cafes, bistros or restaurants who could not afford this year’s promotion. –Amy Huerta, City of Fresno’s Local Business Initiative Manager. According to Huerta, the $500 fee the 25 restaurants paid is projected to provide about $12,000 in advertising. Each participating restaurant posts a poster listing all participating eateries. They all put aside competition for the power of group marketing. The auto industry learned a piece of this strategy years ago when they banded together and now can be located in auto centers rather than spaced miles apart. Piazza Del Pane has a $22 pre-fix dinner menu which includes an appetizer, choice of entree, dessert, and a glass of wine. This is true whether purchases are made from one of the local farmer’s markets to the guy who repairs shoes. A list of the FRIBA membership is on their web site; each pays $150 annual fee. Other cities across the country have organized restaurant weeks, including New York City and San Francisco. In fact, the Open Table, an Internet restaurant reservations site has a special web address just to organize Restaurant Week Specials and Prix-Fixe Menu Offers from Coast to Coast. 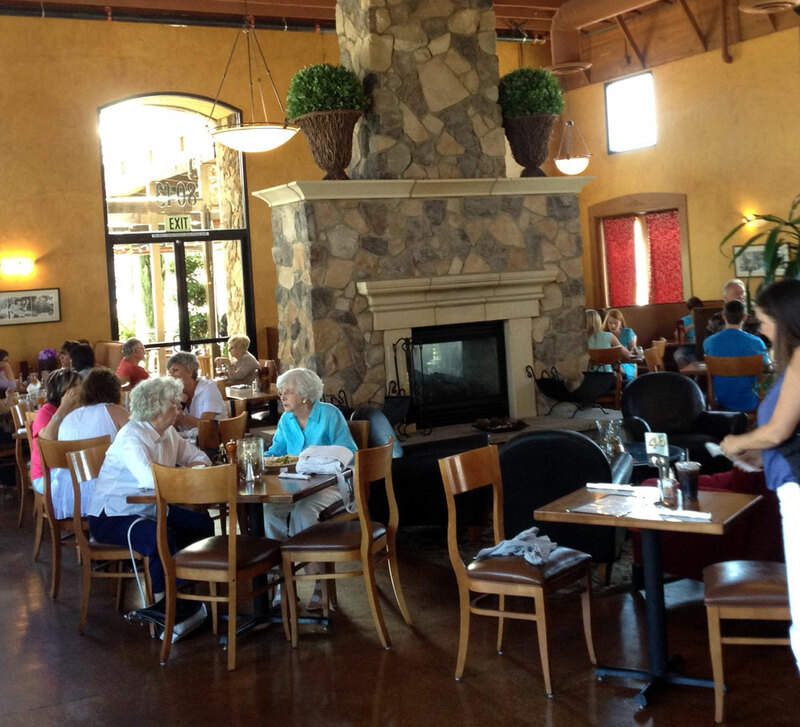 So Fresno County, while the chain restaurants like Denny’s, Outback Steakhouse or Olive Garden might be your favorite, consider opening up your wallet or purse for one of the locally owned independent diners, bistros, restaurants or cafes. Invite a friend or couple to join up for a night on the town. Most of the Fresno Restaurant Week participants have their special menus posted online. Scroll down to review each one, choose a place to eat and make a reservation. The coffers of Fresno County will be glad you did.